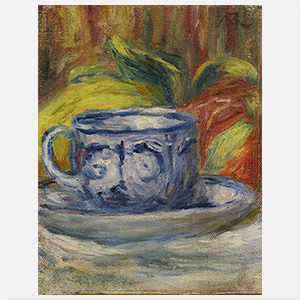 One of the founding members of the Impressionist movement, Renoir was born in Limoges into a working-class family, and trained to become a porcelain painter. From 1862 to 1864 he attended the École des Beaux-Arts in Paris, and befriended the painter Charles Gleyre, who introduced him to Claude Monet and Alfred Sisley. Renoir’s acquaintance with artists of the Barbizon school motivated him to focus painting en plein air. In the late 1860s Renoir started sharing a studio with Monet. Both men often worked outdoors, side by side, and for a while, produced numerous works with similar subjects. 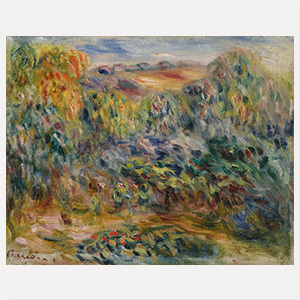 After repeated rejections from the Paris Salon, Renoir showed his work at the first Impressionist exhibition in 1874, alongside Monet, Degas, Pissarro and Morisot. Admired for his loose, downy brushwork in soft tones, that often make his paintings seem dreamily out of focus, Renoir primarily chose ‘modern’ subjects – scenes of ordinary Parisians, enjoying themselves in the parks and cafés of the capital. His Ball at the Moulin de la Galette (1876, Musée d’Orsay, Paris) is an icon of Impressionism.